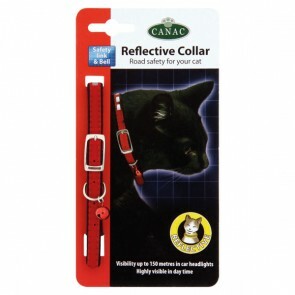 Plain & reflective Collars: 5 stars out of 5 based on 4 user reviews. I have been using Canac Safety collars for over 16 years and definitely think they are the best on the market. I have five cats and they always have a Canac collar on, I know if they get caught on anything the collar will break at the safety link. Only wish they still did the 10" collar as well as the 12". I have to cut some off the 12 inch because they are too long. Highly recommended. bought two of these for mother's cat.. have been searching for my two and found at last! 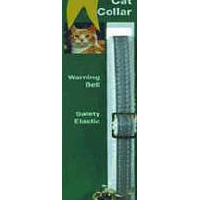 Best collar out there..so much safer than the others you get in all those big stores and so much kinder softer and less bulky for the poor cats neck! ..now looking for pug equivalent! Best cat collar on the market. Glad to find it on the internet after supermarket stopped selling these. The buckle fastening is much safer than the snap ones which kept breaking and resulted in the cats losing both collar and identity tags. The reflective strip works very well at night, and the bell warns the birds! Thoughtfully made cat collar. Liked the reflective insets. The small bell I can even hear with my deaf aid. Finally the elasticated safety piece is perfect to get puss out of a nasty scrape.